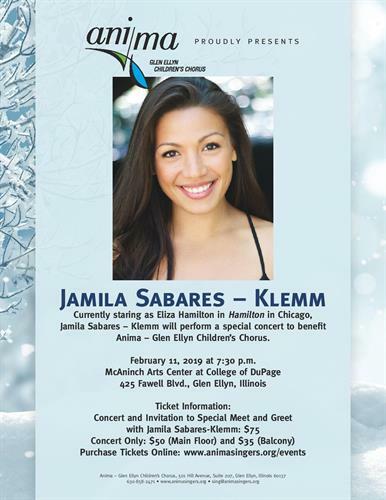 Jamila Sabares-Klemm, who currently stars as Eliza Hamilton in Hamilton in Chicago, will perform a special concert to benefit Anima – Glen Ellyn Children’s Chorus. Fans of Hamilton and supporters of Anima – Glen Ellyn Children’s Chorus will want to be in attendance at this close and intimate benefit performance at the McAninch Arts Center at College of DuPage. Jamila Sabares-Klemm will perform Broadway favorites accompanied by William Buhr, principal accompanist of Anima. Anima’s select Chamber Ensemble, prepared by Artistic Director, Charles Sundquist, will perform a selection with Ms Sabares-Klemm. 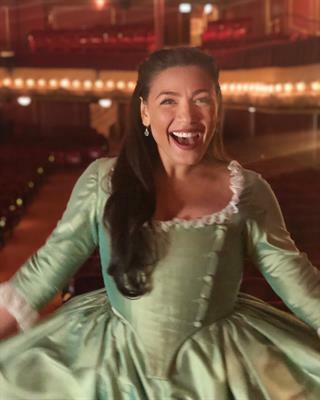 After the concert, Ms Sabares-Klemm will greet patrons who purchased specific combination tickets for upfront seating and special after concert meet & greet. For all inquiries, please email sing@animasingers.org or call Anima's office at 630-858-2471.